The Ferrari 458 Italia is one of the most beautiful cars to wear a prancing pony ever. Beyond the Italian styling and craftsmanship, the sports car is a very fast machine (especially in the 458 Speciale form). Of course it has a few quirks, like not being able to see the navigation map and the speedometer at the same time. However, once you get behind the wheel all of its flaws go away. Click past the jump (or scroll down if you came directly to the full article) to watch a video of the styling of the Ferrari 458 Italia and find out how the owner prevents dents. If you owned a 458 Italia and decided to go to a restaurant how would keep it from getting dings in a parking lot? The owner of this car has a two part method. First he parked in the back section of the lot. While that helps what really keeps people from dinging his car is the fact the he is taking up two spaces. This potentially would keep folks from getting too close, although one would need to be careful as there are those that will key a car for such a jerk move. Perhaps a carcover would have kept the possibility of people messing with the car to a minimum. If that is too much work there are other car protection devices that are faster to put on and if you can afford the car, you should be able to afford a protection device. 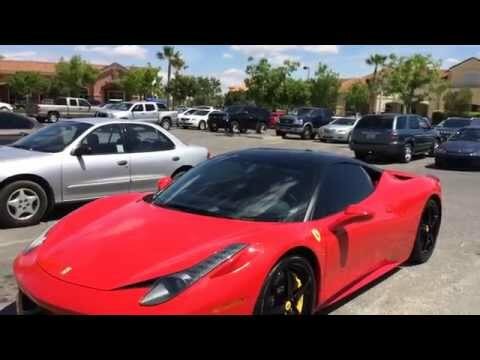 Check out this video capturing the styling of the 458. From the Formula 1 derived technology found in the front facia to the mid-mounted V8, it is just a stunning machine. Let us know what you think of the Ferrari and your thoughts on it taking two parking spots in an attempt to keep it looking new. Trouble watching this video? Go to the original YouTube video.